Terri Schiavo lapsed into a coma from complications of an eating disorder. Electrolyte imbalances from repetitive bulimic binge/purge cycles can damage the electrical function of the heart, in some instances causing the heart to stop beating. Following a bulimic purge in February 1990, Terri suffered a potassium deficiency that resulted in cardiac arrest, depriving parts of her brain of oxygen for 14 minutes, causing extensive brain damage. It is disappointing that the focus of media coverage has been on matters concerning family disputes, the courts, and church/state politics to the exclusion of the condition leading to her demise. Terri Schiavo was the victim of bulimia nervosa, the most lethal of all the mental health disorders. Of the 13 million people in the US today who suffer with anorexia, bulimia, or compulsive over eating, six to 13 percent will die or be maimed from complications of these disorders. Though 87 percent of victims are under the age of 20, adults like Schiavo may carry unresolved disorders with them for decades, into their 30’s, 40’s, and 50’s, into their marriages, parenting, and professional lives. Some will carry the disease to their death bed. It is hardly surprising that in the reporting of this case, Terri’s eating disorder remained essentially undercover. Families are typically either uninformed or reticent to discuss these illnesses cloaked in shame, stigma, fear and misunderstanding. Many parents feel inadequate and disempowered to intervene, assuming personal guilt for causing their child’s eating disorder… and all too many health professionals corroborate this false notion. The fact is that parents are not to blame for their child’s eating disorder; eating disorders are diseases, like diabetes or cancer; their origins lie in brain chemistries, temperament and genetic predisposition. 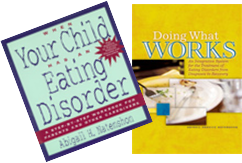 Though not responsible for causing their child’s eating disorder, there is a great deal knowledgeable parents can do to facilitate healing. Parents influence and shape their child’s attitudes, a healthy eating lifestyle within the home, and a supportive emotional environment conducive to treatment and cure, even when their offspring is no longer a child. As diagnosticians, mentors, and recovery advocates, parents need to remain authoritative and “parental,” taking charge whenever appropriate, and wherever possible, for the eating disordered child who is incapable of responsible self-care. When it comes to an eating disorder, simply loving one’s child is not enough. Action is prerequisite to healing. Because these diseases do not typically show up in doctor’s offices, but around kitchen tables and in family bathrooms, parents as diagnosticians need to learn what to watch for, how to listen actively, and how to help a child learn to listen to her/himself. Parents are advised to seek advice, counsel and support for themselves throughout a recovery process that invariably becomes a shared family crisis. A person can identify an eating disorder just by looking, through physical appearance alone. In fact, bulimics are generally of normal weight, often physically fit. I know of a perfectly healthy looking teen in recovery from bulimia who went to sleep one night and never woke up. Eating disorders are incurable. In fact, eating disorders arecurable in 80 percent of cases where they are detected early and treated effectively. Eating disorders are a form of insanity. Eating disorders typically occur in healthy personalities, where they represent temporary coping devices for adolescents and young adults struggling to survive the stresses of turbulent years of change and transition. Through the most benign intentions, people like Schiavo initially turn to bulimia as an easy method of weight management. Schiavo had been overweight throughout her teen-age years. Bulimia is a repeated cycle of out of control eating followed by some form of purging, including self-induced vomiting, obsessive exercising, and excessive use of laxatives, diet pills or diuretics. An eating disorder is a misuse of food to resolve emotional problems; by taking control of food, the victim feels in control of life itself; in an ironic turn-about, dysfunctional behaviors become compulsions, and tenacious habits take control of and enslave their host. 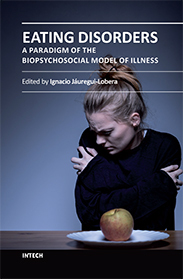 Behavioral, physical and emotional aspects of bulimia affect the victim’s capacity to solve problems in life-spheres extending beyond food, eating and weight management. All three realms must be addressed simultaneously for treatment to be effective. Health problems that occur as a result of bulimia may include osteoporosis, reproductive problems, kidney and digestive problems, and heart failure. Continued nutritional insults and abuse to the body will damage and compromise vital organs and bodily systems eventually to the point of no return. A 20 year old college athlete, neurologically impaired from a bulimic coma, will spend the rest of her life in a facility for individuals incapable of self-care. An edematous hospitalized 42 year old woman, bulimic for 26 years and in a starvation mode, is in such a state of decline that her abdomen wall is incapable of supporting a feeding tube. Engages in binge eating, binge exercising which she cannot voluntarily stop. Displays excessive, erratic, impulsive, or compulsive behaviors in life spheres beyond food and weight management, such as studying, shopping, promiscuity. Copes with emotional stress through food abuse or over-exercising. Abuses laxatives, diuretics, diet pills, Ipecac. Engages in repeated dieting and repeated dieting failures. Frequents the bathroom during and after meals. Suffers mood disorders, depression, feels out of control. Has swollen glands, menstrual irregularities. 59% of hospitalized bulimics have experienced sexual or physical abuse. Eating disorders kill and maim. Had her bulimia been addressed and treated early on, Terri Schiavo most likely would have been alive today. Her passing has the potential to make a real and positive difference in the lives of millions of people who need to know more about what eating disorders are about, what they do, and how they can be recognized. So that Schiavo will not have died in vain, there are important lessons to learn from the errors of her health professionals who failed to diagnose and treat her condition, from her parents who did not have the knowledge or foresight to press on in seeking help, and from the woman who could not envision life without her eating disorder. It remains for the community at large to encourage Congress and state legislatures to move forward on approving legislation that requires insurance companies to cover the treatment of eating disorders. Insurance companies need to support treatment for eating disorders in their earliest stages to facilitate secondary and tertiary forms of prevention, saving lives and millions of health dollars; currently families supporting children in recovery from eating disorders find that they have to sell businesses, homes, deplete retirement accounts or life savings to save the life of their loved one.